As a quick follow-up to the part 6 article from our solo defense turtles guide, looking at testing 5 different armies under controlled conditions, we received quite a few comments asking for the results to be done with T4 troops instead of T3 troops. Just as a quick summary of my responses to those comments, the purpose of that test was purely to test the relative differences between 5 separate armies. It was not to test the differences in strength between attacker and defender, but really to look at how the different defensive armies compared when hit with the same attack. Yes, we could have used T4 instead of T3, but ultimately it would not have made any difference in assessing the relative defensive merits of the 5 armies. It would have just cost more. As it was, the test required speed training of 2M T1, 2M T2, in addition to the healing of wounded T1-3, and retraining of the attacker’s lost T3s. If you use the troop training calculator, you can work out for yourself what it costs to train 2M T1, 2M T2, and retrain around 600k strat T3. As outlined in part 5 of the turtle guide, T4 are ONLY 50% stronger than T3, so it is quite possible to do some quick calculations to assess the kind of damage that substituting T4 for the T3 used would have made on the results. But as also outlined, they are also 6-7 times as expensive to train in res terms, and 50 times as expensive in silver terms. Enough was spent on that test without also having to retrain T4s as well. There were also several very valid comments on the use of a balanced attack rather than a single troop type attack, being in line with the article on this site about the merits of balanced attacking. In almost all my attacks I use single troop type with an optimised hero. I will be presenting a series of controlled tests on the differences with balanced vs single troop type in a future article using the same hero, in addition to the same attack but with a hero optimised for single troop type. But the goal with the part 6 was to try and standardise as much as possible, to minimise the number of variables that could affect the result, and as such, the decision was made to go ‘plain vanilla’ with a balanced army. But seeing as everyone wants to see T4 hits, please find below a hit on the 8M T1 account with a 375k march of T3-4. The hero used by the attacker was a fire-age gear optimised set for infantry, with legendary hell vent helm, legendary slag stomper boots and one legendary lava wielder, in addition to Hera’s gown (20% infantry attack in addition to health / defence boosts), Fire-tipped Spear and 2 Violent Beauty Wings. This hero was clearly focused on infantry attack. The attacker sent an optimised infantry attack for almost maximum damage, with this example using 292.5k Strat T4 Legionnaires, with 82.5k Strat T3 Phlangites as T3 meat shield. Defending force was almost 8M regular T1, evenly balanced. And the defending hero was STRONGER than the one used in the tests in part 6 of the turtle guide. You may remember that the boosts on the city were relatively lowered to match the boosts on the city used for tests 1-4. This was a real life hit, with the defending hero using their full set of gear with hero tree set for battle. The attacker wounded 511K T1, with around 400k of them being cavalry, and 50k each of infantry and ranged T1. Points gained of +27.5M, enough for 40k gold top prize in one hit. Points given up of 0, given all 511k T1 went into hospital. We required 3M res to heal our T1s, and they instant healed, ready for another hit. The attacker requires 700M res to retrain their lost T3-4 troops, in addition to 122M silver, and quite a bit of time to retrain them as well. If we examine it from the perspective of Damage delivered and sustained, the Attacker delivered 511,357 damage (511357 * 1 for Tier 1 relative strength), whilst the Defender delivered 1,338,907 (82,500*3 + 242535 *4.5). The Damage ratio is thus 2.62, in favour of the defender. The defender delivered 2.6 times as much ‘damage’ as they sustained. Whilst it was not a completely maxed attack of 375k strat T4 legionnaires, the 292.5k T4 + 82.5k T3 delivered 93% of the damage of a full 375k T4 hit. In this example, both heroes were specced maximally, with attacker having maxed infantry attack, and the defender optimised on overall troop attack and troop health. The guidance on hospital bed capacity is completely in line with what was presented in Part 4 of our turtle guides, being up to 600k hospital beds required if you are going with an army that includes a significant number of T1 troops, going up against an optimised hero with fire age or Xena valentine’s gear with a single troop type attack. And tomorrow, we will get back on track with the solo defense turtle series. This is a very good point. I’d say that you can easily loose 1m t1 ones even if the attacker only uses normal set gear and a level 57-58 hero. With those types of gear people get soloed op and above 200m power. I have not had real world experiencs like these. For instance, you casually blow off T4 attacks as being only 50% stronger but seemingly ignore the massive research advantages that likely come with an SH21 level 55+ hero. You also illogically assume an equal attack ratio. I never send equal ratios. My hero is level 55 and I have several presets. When I attack, I choose a missle setup with roughly 1,000% boost on attack. What is a more realistic (IMHO) setup of the trap having a mixed army, while the attacker is sending 375k T4 with attack boosts over 1,000% and probably even a couple hundred percent enemy defense debuff or enemy health debuf? I am not trying to be difficult, but I know of almost no one who attacks with less than 375k t4 missles. I have had a pretty good run with my landmine at 77 mil kills so far. But my question is more about these new cores? How do you defend and not lose so so many troops against a full core suit? I have lost two mil t1 on one hit! Is there a nerf programmed in for a maximum amount of effective troops. In the last KVK i played a level 9 account and had 2.7 mil T2 evenly spread in troop type. I got attacked by a 375 T4 march. I killed 128K and lost 240K. The attackers gear was good combat gear and I have good gear for a 46 hero. Without out looking and getting the exact boosts and gear it looks like i had a better kill ratio considering the troops I had. The T2 NERF levels are not definitively known. Some people think they are 5M T2, in which case you can almost double your troop count without worrying about being NERFed. All that matters these days is enemy power destroyed. If you lost less power than you destroyed, then you won. Doubling your troop count will almost double the amount of damage you deliver, but will also almost double your power level, and hence may result in a reduction of the number of people who will hit you. These articles are excellent btw. Keep up the good work. Just a q on the RSS required to heal. I would have thought 500k T1 troops would cost far more than 3m to heal no? Each 1 costs 20 stone/wood. Or am I being daft and missing something really obvious? So should for example, a Sh21 turtle for no reason take a rally hit? Does this usually happen in real world kvks? As far as rallys and such? Is there a section coming for permanent hero gear for trap accounts? Should it be trap based? Troop based? If troop based, geared to a specific troop type? Thanks. I recently saw a post on another forum where a stronghold 14 uses approximately 4.9 million tier one and 4.9 million tier two troops, as they are wary of the nerf that tier one and two troops have taken. It’s overall power is approximately 50 million, which is over the 30-35 million you have recommended in your guides. This stronghold also has no hospitals, and retrains all units killed after the battle, using many villas and speedups. Taking hits, this stronghold seems to have performed extremely well. Taking a full rally of mostly tier three troops, the stronghold lost 2.3 million overall, but doesn’t have a maxed hero or amazing hero gear. I’d like some input on the viability of this build, if you can give any. This is a viable build. No-one knows for certain what the NERF limit is for T1-2 troops, but this person has worked out a way of getting 90% of the benefit of T1-2 troops without running the risk of being NERFed. When I build an sh14 turtle, I never let it take rallies. It drops tags before Kill Events, and cannot be rallied as it is below sh15 and not in an alliance. If an sh14 is going to take rallies, then it is eminently reasonable not to have hospitals, as it is just too hard to retrain troops at sh14 when you have used up city space for hospitals. If taking solo hits, I prefer sh14s to have hospitals to instant heal, ready for the next hit. Could you comment some more on SH14 turtles? It is hard to get a feel for how many t1/t2 troops are needed, and how many t3/t4 troops they can be expected to deflect in a solo attack. These experiments are useful, but SH21 research is a lot more powerful than SH14. It is true that sh21 research is higher than sh14 research. Having said that, a level 50 hero will still have sufficient hero skill points to appropriately set a hero tree, and good hero gear will overcome any differential in research boosts. Research boosts account for 10-40% of the overall combat boosts, depending upon the strength of your hero. For example, troop health 8 gets you 66% health boost, whereas setting hero tree for battle with troop health 1 and troop health 2 maxed will give you 122% boost. You can then comfortably add another 200% with hero gear and gems using standard materials, which means that the research component is a much smaller proportion of total boost. As always, there is a complex interaction between the number of troops and the level of research / hero boosts. Roughly speaking, if your boosts for troop health / defines / attack are half of what has been outlined in this series so far, then you will need twice the number of troop strength to compensate. The sh level is a bit of a red herring. It all comes down to overall boosts, and if you have slightly less from research, then you either need slightly more hero boosts, or slightly more troops. That helped a lot. Thanks for sharing your insights! When you spec and gear your SH14 turtle hero, what is the skill layout? Health, then Attack, then Defense? Mine is L45, so I assume I just run down the left side, straight to Troop Health II 50/50, and work my way backwards? Also, if you are assuming your SH14 is full of t1 balanced, don’t you still need some Defense to reduce casualties? I know that Attack is what generates the enemy kills and KvK points. Finally, I didn’t see this in another article: I have gathered lots of normal materials, so the Bargain gear is accessible. I can build a gold Xena’s Crown, for example. But I am still a little clueless on how to generate event gear materials sufficient for legendary event gear, even with Monster Mastery 4.
Who the hell is hitting a sh 14 with 50 million power? There is a sucker born every minute. Last KvK I had a single SH21 player with 1B power hit my punching bag repeatedly. He hospitalized the same 120k t1 balanced army about a dozen times. He took 0 KvK points, and handed me a cool quarter million, for nothing more than resources. Many people just don’t think in terms of math. Thanks for adding this – great to see, and it helped me understand exactly how the relative strengths of troop compositions play out. What level sh was the defender at? Why was there no damage to your traps! Combination of factors. 8M Tier 1 troops in front of 125k T3 traps. 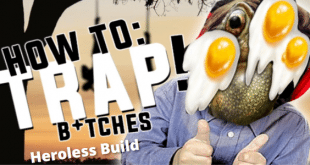 And if you read our guide to traps, http://www.insidegameofwar.com/guide-traps-game-of-war/ you will appreciate that damage delivered is split between number of troops and number of traps. 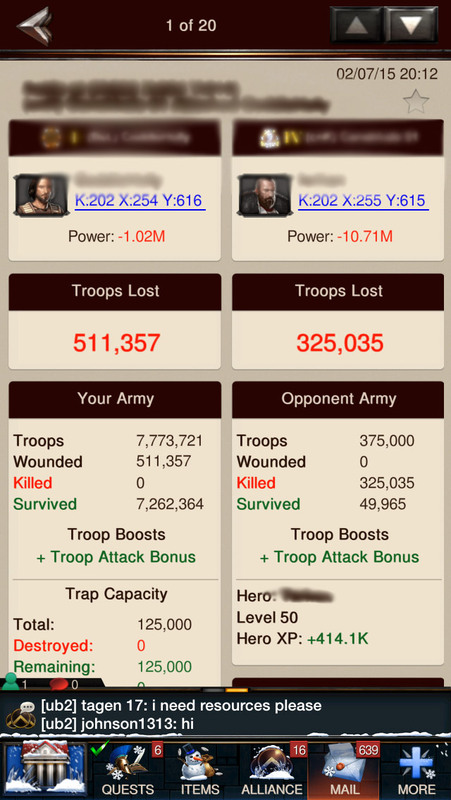 So if you have 8M troops and 125k traps, then 1.5% of the damage is delivered to the 125k traps, and 98.5% delivered to the 8M troops. But in this instance the traps are kind of ‘behind’ the lower tier troops……..
Is the traps vs troops damage split by raw number, or by relative strength? If you have 25k t1 troops and 25k t2 traps, is it 50/50 or 33/67? Thanks for showing the t4 strike. Even though you can extrapolate t3 by 50%, sometimes folks just need to see the example. For those of us new to ideal heroes, research, and gear, could you broadly summarize the bonuses on that hero? I wanted to try a SH14 turtle, but even with level 50 hero and L6 gems, my build will be limited to L3 cores and be missing key troop research boosts. btw, I ran my SH14 out there solo for the last KE (my first KvK). Using your many guides, I scored 450k+ points, enough for the available kingdom event prizes. Placed #15 in my kingdom as well. I only gave up 22k points in return, a 20:1 ratio. For the next one, I will have far better gems and combat research, and a hero 45. Thanks for sharing all the great advice! I’m thinking of stopping at level 14 for awhile using a turtle set up as well. May I ask what your set up is currently? Any insight would be much appreciated! My trap build is just getting started. What I have is more like a SH14 punching bag that yields good KvK points. My defensive backbone is 240k hospital capacity, with 80k each of t1 infantry, ranged, and cavalry. This setup yields 0 KvK points when hit. The biggest challenge is scavenging enough resources to heal troops between hits, because my storehouse only protects 700k. Troop research for Attack 7 (+46%) and Defense 6 (+31%) are complete. I do not use a hero when defending. A real turtle setup obviously would. I started out using 15k of each t2 trap, with 5k war bricks. I switched to 40k war bricks when I realized that my t1/t2 traps were impossible to maintain during a sustained pummeling, and that I was salvaging a lot less than 70%. I found out the hard way that the salvage research fails when you’re taking t3/t4 troop hits. I have trap research for Attack 7 (+46%) and Defense 6 (+31%). I also have the Hero research for traps at A6/D6 (+31%). I don’t really think that causes many casualties. Once I build up 2-3M t1 meat shields, it will probably be worth it to use the t2 traps again. I do use my hero and t2 units for tile and city strikes. Those units are always kept rallied, as they give up KvK points and take time to heal, and I have no desire to lose my hero for 3 days. With shoddy L1-3 core gear and L5 gems, I have about +125% each to defense, health, and one specific attack category. You can get 6x L5 gems for health, defense, infantry, ranged, and cavalry by completing the rare gem events for Solo and Inferno. Thanks for the reply! Helps a bunch! I should point out, you need to be running anti-scout for this to work. Players tend to stop hitting you when they realize they are only hospitalizing t1 troops, and are giving up unanswered KvK points. Thanks for posting this. I am guessing this was in the last KE? Great hit for that defender. What was the overall power level on that turtle? Under 30 mil right? I really need to know the nerf details. I was under the impression nerf means mz will not allow you to train anymore troops, not that they will let you continue to make more yet they are weaker. That seems rediculous that mz wouldn’t tell you this information while you are training them. I made a turtle for eating rallies. so with 8mil t1 the nerf is not applied yet from what is shown, i am a trap account with 1mil t3 and 200k t1 and 100k t2 need a bit of help seeing if i should delete some t3 because i am 49mil power and unsure what i need to do to get a higher success rate of being hit. im doing the exact opposite of you. i’ve got 900k t1, 600k t2 and 600k t3. goes a bit over the 16 mil power limit set by these guides, but meh. no big deal. I haven’t taken a hit yet, i’m waiting for my kingdom to get kvks. should have them in a few weeks. I’ll let you know how my battles go. be creative 🙂 No need to disband anything, its money. There is no sure way to get hit. But if you get people pissed of on you or your alliance, they will hit, no matter it’s traps or main account haha. This also works remarkably well. Even if you don’t leave your own hive and kingdom, thst little glowing helmet draws attention. Kingdoms that have any number of reasonably intelligent alliances won’t even bother scouting, they just rally right away and make you shield. You’re better off looking like your shield just dropped in my experience. I have two trap accounts, and am in an older kingdom so we fight the big guys. When you teleport in, set all the farms on fire for 25 squares in every direction. That gets a lot of attention. You can also say hello in kingdom chat. Many players are just hot to attack a player they perceive as much weaker. Being an aggressive outlander and chatty will draw all sorts of fire. As everyone else has said, bait bait bait. Be annoying. Change your name to something offensive. Be obnoxious in KC. Burn farms (but always keep your hero at home). Port into forest and hit some bigs with 1 troop marches. Scout bomb people. Set fake rallies on people. Capture heroes. Work it, girlfriend, work it. Another thing you can do is if you know you will only get hospitalized and will kill a good amount of t4 is to stack your stronghold with millions and millions of RSS and leave anti scout off. I have been guilty of hitting 40-50 mil players because when I see the scouting report with 100 mil of each rss I get so enamored that I don’t even look at their troop count. Then I hit them and lose half of my t4 troops. This is my plan for my sh18 turtle once I get it to hero 50 and can wear better gear. ^^I’ve been using this trick and it works very well. Most of the time, a big will scout and sit for a while. I can see them churning the idea in their head. The key is being ready to shield so as not to lose troops once hospitals are full, or being very quick with healing. Most of the time, the bigs will send multiple attacks to collect the RSS quicker. Thank you for the tips everyone I will be trying these this Thursday hopefully i’m not up to 4 am before I finally get hit.